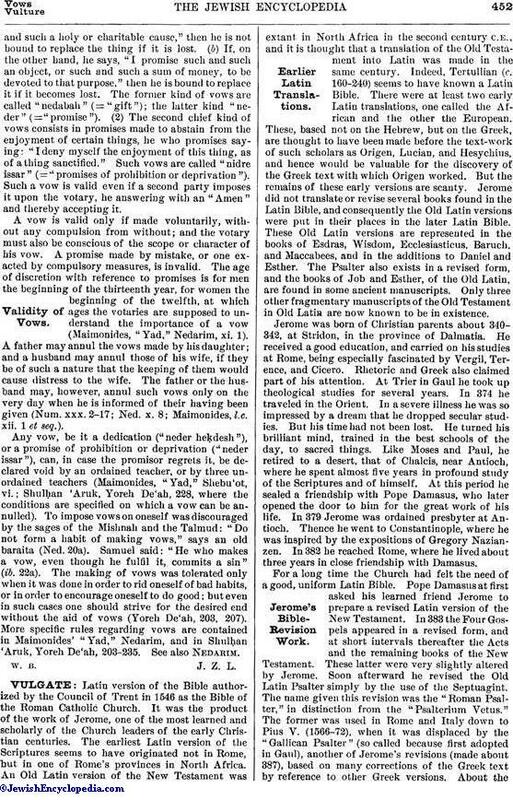 Jerome's Translation in Later Times. Latin version of the Bible authorized by the Council of Trent in 1546 as the Bible of the Roman Catholic Church. It was the product of the work of Jerome, one of the most learned and scholarly of the Church leaders of the early Christian centuries. The earliest Latin version of the Scriptures seems to have originated not in Rome, but in one of Rome's provinces in North Africa. An Old Latin version of the New Testament was extant in North Africa in the second century C.E., and it is thought that a translation of the Old Testament into Latin was made in the same century. Indeed, Tertullian (c. 160-240) seems to have known a Latin Bible. There were at least two early Latin translations, one called the African and the other the European. These, based not on the Hebrew, but on the Greek, are thought to have been made before the text-work of such scholars as Origen, Lucian, and Hesychius, and hence would be valuable for the discovery of the Greek text with which Origen worked. But the remains of these early versions are scanty. 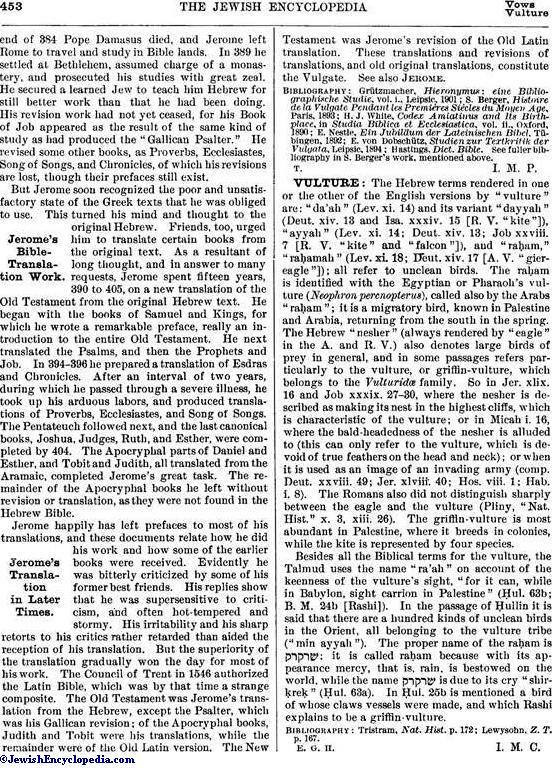 Jerome did not translate or revise several books found in the Latin Bible, and consequently the Old Latin versions were put in their places in the later Latin Bible. These Old Latin versions are represented in the books of Esdras, Wisdom, Ecclesiasticus, Baruch, and Maccabees, and in the additions to Daniel and Esther. The Psalter also exists in a revised form, and the books of Job and Esther, of the Old Latin, are found in some ancient manuscripts. Only three other fragmentary manuscripts of the Old Testament in Old Latin are now known to be in existence. For a long time the Church had felt the need of a good, uniform Latin Bible. Pope Damasus at first asked his learned friend Jerome to prepare a revised Latin version of the New Testament. In 383 the Four Gospels appeared in a revised form, and at short intervals thereafter the Acts and the remaining books of the New Testament. These latter were very slightly altered by Jerome. Soon afterward he revised the Old Latin Psalter simply by the use of the Septuagint. The name given this revision was the "Roman Psalter," in distinction from the "Psalterium Vetus." The former was used in Rome and Italy down to Pius V. (1566-72), when it was displaced by the "Gallican Psalter" (so called because first adopted in Gaul), another of Jerome's revisions (made about 387), based on many corrections of the Greek text by reference to other Greek versions. About theend of 384 Pope Damasus died, and Jerome left Rome to travel and study in Bible lands. In 389 he settled at Bethlehem, assumed charge of a monastery, and prosecuted his studies with great zeal. He secured a learned Jew to teach him Hebrew for still better work than that he had been doing. His revision work had not yet ceased, for his Book of Job appeared as the result of the same kind of study as had produced the "Gallican Psalter." He revised some other books, as Proverbs, Ecclesiastes, Song of Songs, and Chronicles, of which his revisions are lost, though their prefaces still exist. But Jerome soon recognized the poor and unsatisfactory state of the Greek texts that he was obliged to use. This turned his mind and thought to the original Hebrew. Friends, too, urged him to translate certain books from the original text. As a resultant of long thought, and in answer to many requests, Jerome spent fifteen years, 390 to 405, on a new translation of the Old Testament from the original Hebrew text. He began with the books of Samuel and Kings, for which he wrote a remarkable preface, really an introduction to the entire Old Testament. He next translated the Psalms, and then the Prophets and Job. In 394-396 he prepared a translation of Esdras and Chronicles. After an interval of two years, during which he passed through a severe illness, he took up his arduous labors, and produced translations of Proverbs, Ecclesiastes, and Song of Songs. The Pentateuch followed next, and the last canonical books, Joshua, Judges, Ruth, and Esther, were completed by 404. The Apocryphal parts of Daniel and Esther, and Tobit and Judith, all translated from the Aramaic, completed Jerome's great task. The remainder of the Apocryphal books he left without revision or translation, as they were not found in the Hebrew Bible. Jerome happily has left prefaces to most of his translations, and these documents relate how he did his work and how some of the earlier books were received. Evidently he was bitterly criticized by some of his former best friends. His replies show that he was supersensitive to criticism, and often hot-tempered and stormy. His irritability and his sharp retorts to his critics rather retarded than aided the reception of his translation. But the superiority of the translation gradually won the day for most of his work. The Council of Trent in 1546 authorized the Latin Bible, which was by that time a strange composite. The Old Testament was Jerome's translation from the Hebrew, except the Psalter, which was his Gallican revision; of the Apocryphal books, Judith and Tobit were his translations, while the remainder were of the Old Latin version. The New Testament was Jerome's revision of the Old Latin translation. These translations and revisions of translations, and old original translations, constitute the Vulgate. See also Jerome. Hastings, Dict. Bible. See fuller bibliography in S. Berger's work, mentioned above.